Kamar Baldwin drives past a St. John’s defender in Butler’s 80-71 win over the Red Storm on Jan. 19. Baldwin scored a season-high 30 points in the game. Photo by Jimmy Lafakis. 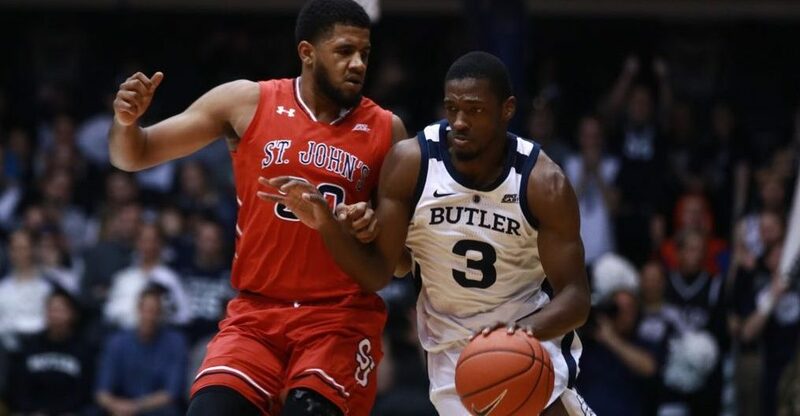 The Butler men’s basketball team picked up a second straight win with an 80-71 victory over St. John’s at home on Jan. 19. Here’s a look at 10 key quotes from after the game. On a competitive second half: “They got more aggressive in the passing lanes. … We got a couple rebounds that got taken away from us. .. Just fundamental things that seem boring when we’re practicing them, but they’re very important when you’re trying to execute against a high-level team like that.